Angela came in from outside and said that a couple trees in a common area in front of our house were full of small birds. They had been eating red berries from a large nearby bush. I grabbed my camera with the 80-400mm lens and went out front. The birds were high in the top of the trees, but they were well lit by the late afternoon sun. Their chests were glowing from the sunlight. We were not sure what they were because of their distance, but when I zoomed in with the camera, we could see that they had dark masks with a white streak and bright yellow chests. 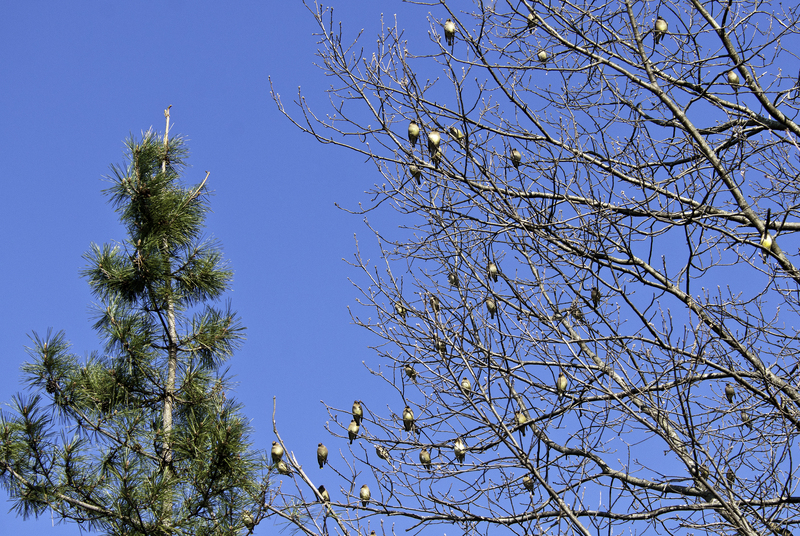 It was a flock of cedar waxwings. There were more than 25 flitting around the tree tops. From out of nowhere, a hawk flew quickly through the tree tops, and the cedar waxwings took flight chased by the hawk. They were fast, and I did not see the hawk catch any. The hawk circled a few times, but the cedar waxwings had left. 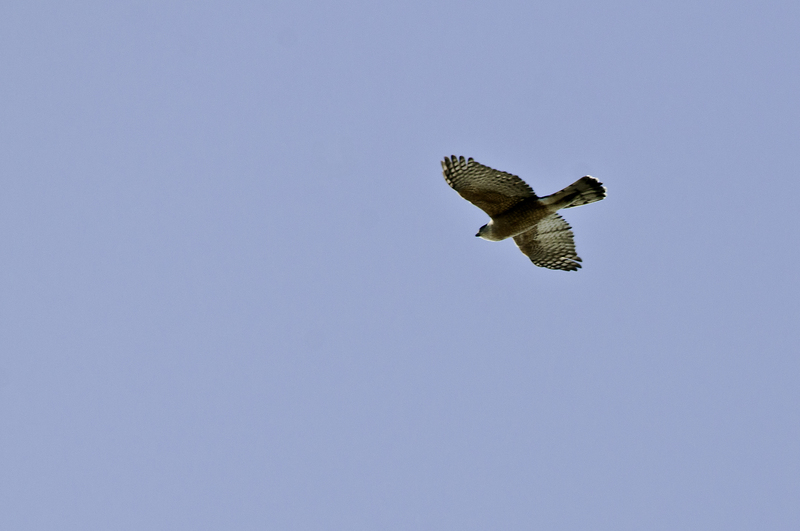 By the time I was able to focus on the hawk, it was high in the sky. 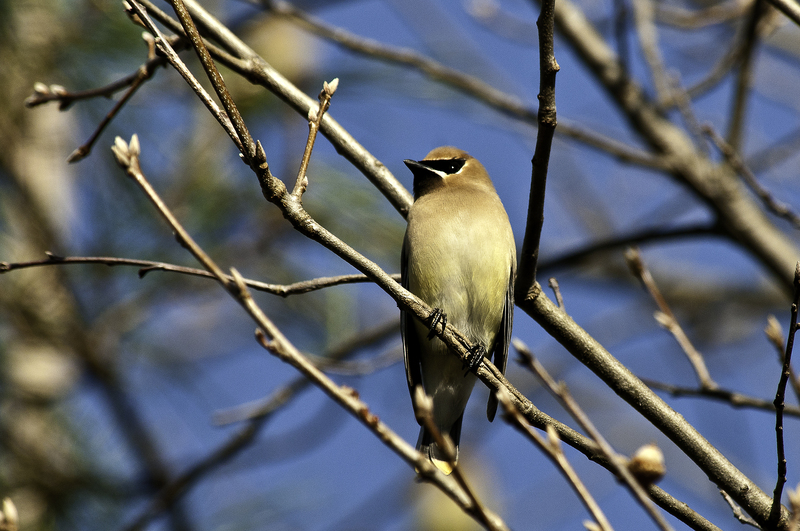 Below are a few photographs of the cedar waxwings and one of the hawk. I cannot believe the amount of wildlife you have in your area and especially in your backyard! You are so fortunate but then again, I too, may have lots of wildlife but never see them. I need to get outside more. Mean old hawk!!! Weren’t you at Amy’s when the hawk came and got the neighbors pet parrot out of the tree??? SO SAD!!! It was amazing how it went from peaceful, little birds chirping in the trees to quick, panicked flight when the hawk showed up. Yes, I was at Amy’s at the time. It was not a happy time for the boy that found out what had happened to his pet cockatiel. We witnessed his reaction.